Since rumors of a 2016 presidential bid began last year, comparisons between Rand Paul and his father Ron Paul have occasionally been drawn. But since officially announcing on Tuesday that he is running for president, some have surely wondered how the younger Paul, a Kentucky senator, is different in his policies compared to his libertarian father. After four years of his first stint in office, Rand Paul has proved himself to be quite unlike his father. Ron Paul's school of libertarianism — socially conservative, free-market, non-interventionist — is a significant influence for sure, but the senator has not embraced those values totally, resulting in his father's purist libertarian supporters not totally embracing him either, The New York Times reported. For one, Rand Paul has said that he supported sanctions on Russia — though, curiously, he voted against it — for its role in the Ukraine crisis. In an op-ed in TIME, Rand Paul wrote that if he were president, he would take a tougher stance on Russia, including imposing economic sanctions and visa bans. Ron Paul, on the other hand, took a completely opposite view, saying that Crimea had a right to secede from Ukraine to Moscow, calling U.S. sanctions against Russia "an act of war." On the issue of climate change, Ron Paul is a virulent denier. He has flatly dismissed the science behind global warming, having called it "the greatest hoax I think that has been around for many, many years." The 52-year-old Kentucky senator, on the other hand, seems like he is refreshingly realistic about climate change — he was one of 15 GOP senators who voted this year for an amendment that stated climate change was real, and he has suggested that he was open to carbon dioxide emission regulations. But he has also directly contradicted those moves by voting against a congressional resolution to cut carbon pollution, and his public takes on the issue typically hint at a suspicion of humans' role in causing climate change. Both father and son are in favor of reforming the war on drugs. Rand Paul supports modest steps to decriminalization and has sponsored bills in Congress for relaxing medical marijuana restrictions as well as penalties for non-violent drug users. His libertarian father takes on a more radical approach, advocating full legalization of all drugs, including the likes of cocaine and heroin (as well as legalizing prostitution and gay marriage). In line with his non-interventionist views, Ron Paul sharply opposes airstrikes against ISIS, blasting some Republicans, including his son, for supporting President Obama's airstrikes against the militant group. 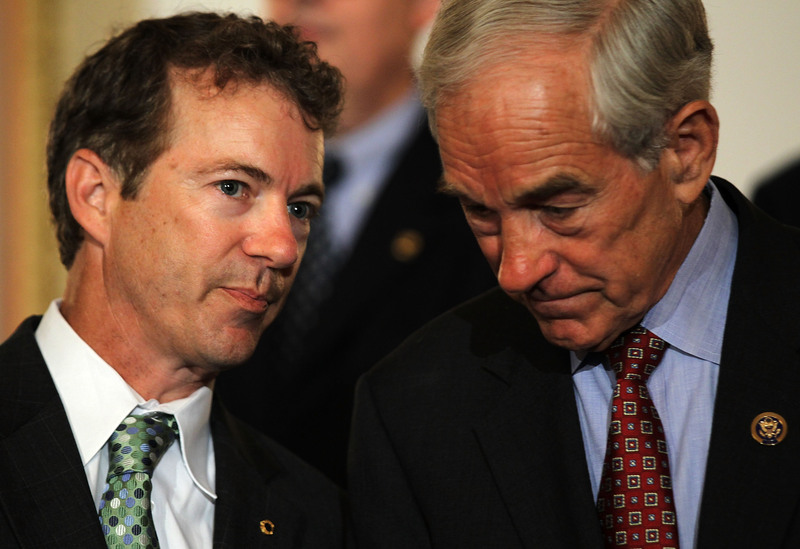 Rand Paul voted for U.S. strikes in Syria and continued to support it, despite evidence that they weren't working. Clearly, both men differ on a number of issues. While the older Paul was seen somewhat as an eccentric candidate in the three presidential primaries he had ran before — and evidently much more radical than his son — the Kentucky senator is focused on extending his appeal to both the moderate and establishment camps in the Republican party, the Times reported, should he want to win the GOP nomination.